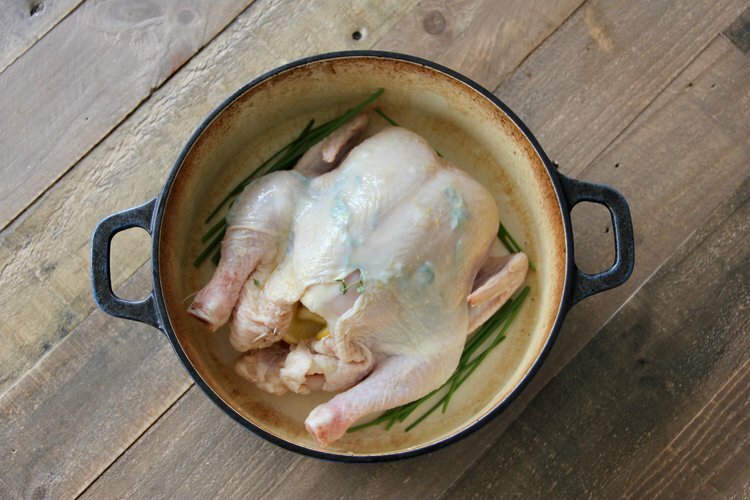 We sing the praises of homemade bone broth but very few people know how to roast a chicken so they can get the bones to make the broth. 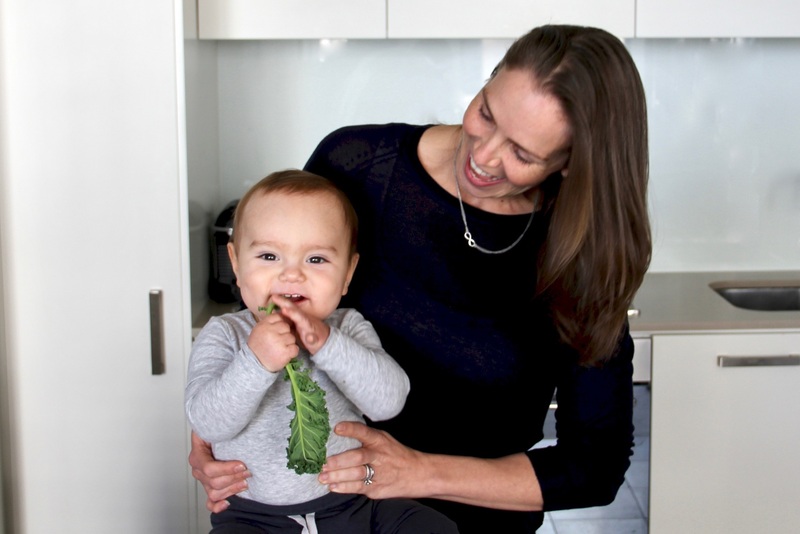 It’s actually the easiest thing to do but you need to have 10 minutes to prep and 2 hours of oven time (so you need to be home for a block of time) which can be hard with after school pick ups and afternoon activities. We make anywhere from 2 to 4 chickens a week in the oven and use the chicken for dinner, leftovers for lunch during the week and sometimes breakfast if we don’t have time to pop and egg in a pan. 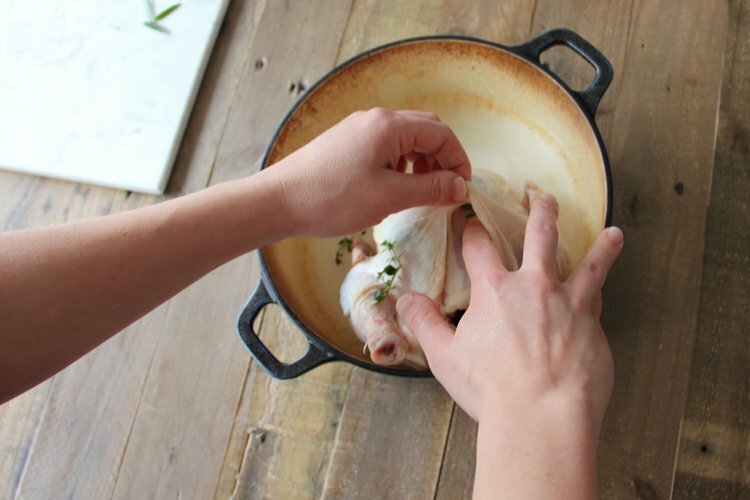 Always buy free range chickens so you can save the bones for bone broth. * All herbs listed above are optional. They add great flavour but are not necessary! Preheat your oven to 230°C Fan Forced (450°F) and place the baking rack in the middle of the oven. Rinse your chicken and pat dry with a paper towel. I like to stuff the cavity with the paper towel for a few minutes while I cut the lemons to dry that out as well. 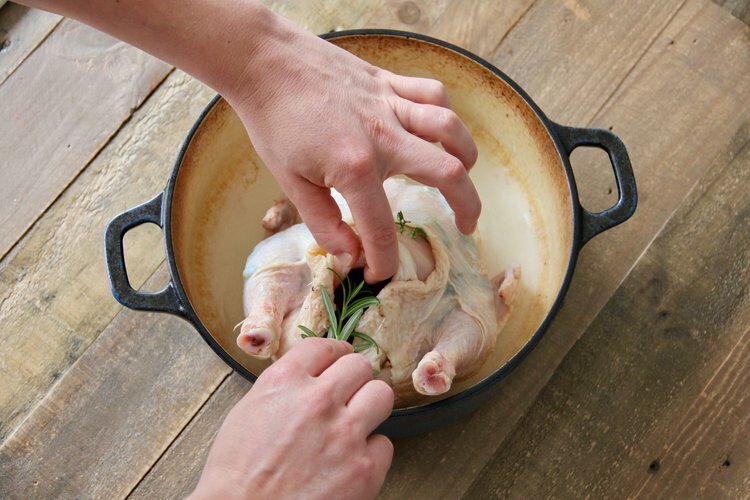 Using your finger, gently separate the skin over the breast and form pockets. Be careful not to split the skin. If you are using fresh herbs, push some into the pockets you have just created. After adding the herbs, lift the skin to open the pockets and pour ~ 1 tbsp of extra virgin olive oil in each side. 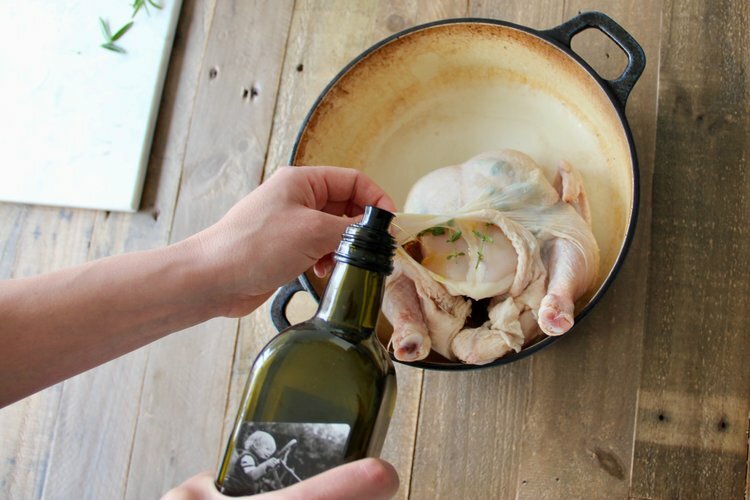 Use your hands to pat the top (over the skin) and move the oil around to ensure it is evenly spread. Remove the paper towel from the cavity and discard. Add the sprigs of rosemary into the cavity. I suggest this, rather than under the skin, because the leaves of rosemary are larger and not as nice to bite down on if they are kept under the skin. The choice is yours though, add these in wherever you’d like! Squeeze the juice of the lemon wedges into the cavity and push the whole lemon rind in as well. I’ve seen people add sliced apple in the cavity as well. I don’t normally do that but if you don’t have a lemon, try an apple or even a whole onion, sliced into wedges. Pour 1 tsp extra virgin olive oil over the chicken and rub evenly over the surface. This will give you the browning effect. Sprinkle salt and pepper over the top. I don’t always have fresh chives in the garden but when I do, I toss a few around the chicken for added flavour. Place the chicken in the oven for 45 minutes. This photo shows what it looks like after 45 minutes. Rotate the pot 180° and bake for a further 45 minutes (90 minutes cooking time in total). 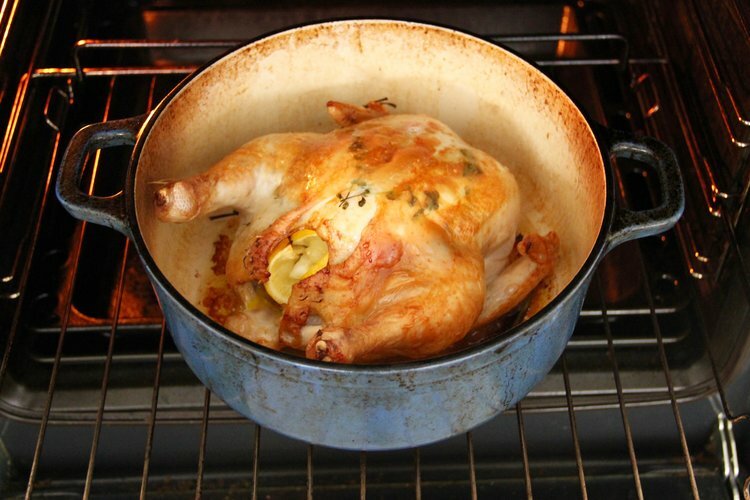 Remove the chicken from the oven after 90 minutes, cover and allow to sit for a further 30 minutes (it will be 2 hours total of oven time + resting time). The result will be a gorgeously browned bird ready to eat! 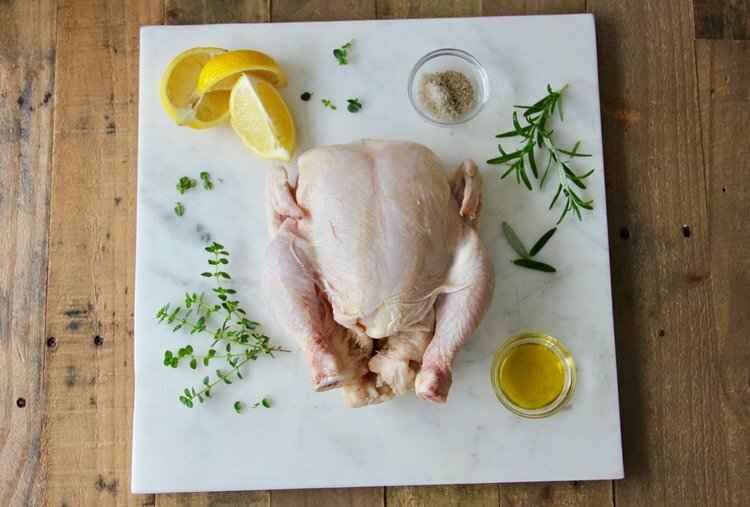 Be sure to purchase Free Range chicken so you can feel good about eating the yummy skin (since it will be loaded with great fats and vitamins A, D, E & K). 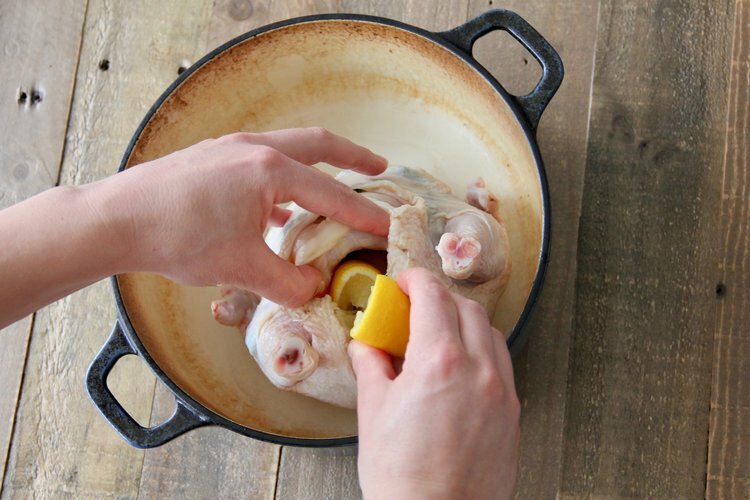 Save the bones in a freezer safe bag for use when making bone broth. The bones can be stored in the freezer for up to 3 months. 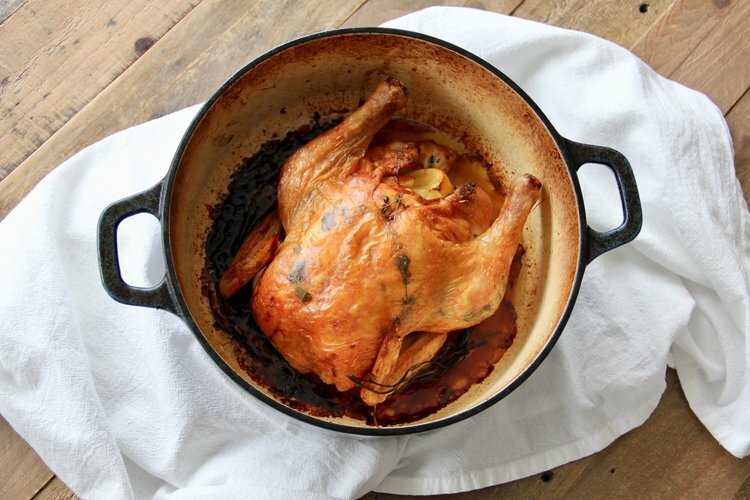 Should you choose to make 2 chickens at once, the oven temperature, cooking time and resting time all remain the same.